One of the greatest New Westminster defensive players in the first decade of the Twentieth Century and the captain of the New Westminster Salmonbellies during their early professional years, Tommy Gifford was born in Lockerbie, Scotland. At the age of seven, in 1887, he moved to Canada with his parents and younger siblings. He was the eldest of the four Gifford brothers who all eventually played professional lacrosse with the Salmonbellies. Two other brothers would play at the senior level for the redshirts. Gifford played his first games with the Salmonbellies in 1898 at the tender age of 18 as an intermediate pick-up. The following year, he won the provincial intermediate championship with the Maple Leaf club of New Westminster. Soon afterwards making his move full-time to the seniors, his presence on the field was so impressive that by 1903, at the still youthful age of 23, he was already recognised across Canada as one of the leading, veteran defenders of the Salmonbellies. He played the coverpoint position, marking the opposing outside home attacker – except in 1911, when he split time playing at point defense. 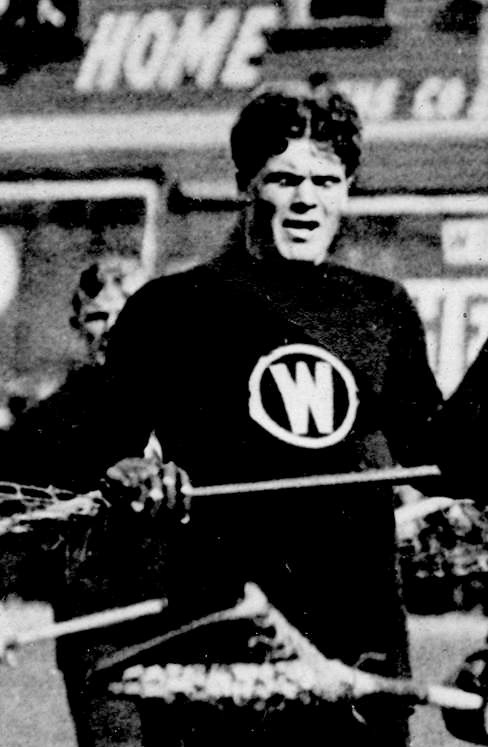 On March 14, 1903, his lacrosse career was almost cut short when Gifford was nearly killed while working as a lineman on one of the city telephone and lighting poles in New Westminster. The rotted-out pole toppled over after he had reached the top and came crashing down on a pile of lumber. He escaped with his life – as well as bumps and bruises to his hip and shoulder. Rare action image of Tom Gifford at Recreation Park in 1911. 1907 was a difficult year for Tom Gifford, who had the young intermediate Cliff ‘Doughy’ Spring chasing him for his spot on the team that June. The following month then saw him on the sidelines with his left arm in a sling after a particular rough match versus Vancouver Lacrosse Club on July 12. He was a central figure in the infamous gunshot incident at Queens Park in 1908 and his leadership presence over the rioting participants to help quell the situation is testimony to the respect he had with lacrosse fans and players alike. Prior to the Minto Cup series against the Regina Capitals, Gifford had been under the weather for a couple weeks with “la grippe” – as the flu was referred to back in the day. With the press reporting he was thus out of shape, Gifford must have found his game feet in time to lay out Gorman. Having played what was described as “a strenuous sort of game all afternoon”, Gifford decided to take a crack at Vancouver enforcer (and future NHL hall-of-fame referee) Fred ‘Mickey’ Ions. With Referee WD Ditchburn in pursuit, Gifford then ran amok on the field at Recreation Park trying to avoid the fine cheque being issued by Ditchburn. He was eventually cornered by the other referee, TD Cusack, and was ordered out of the game after Cusack had stuffed the fine down Gifford’s sweater. The game then resumed – but as Tommy Gifford was heading off the playing field to the Salmonbellies’ clubhouse, he changed his mind and instead made for the Vancouver goal and hung out around there while play continued in the New Westminster end. Neither official seemed to notice him to stop play – so when the action made its way down the field towards the Vancouver goal, Gifford decided to take a run and charge Vancouver point defender and team captain Harry Griffiths from behind. Griffiths then turned around and struck back at the New Westminster captain, chopping the side of his head with his stick. Now sporting a big gash, Gifford then swung back at the three Vancouver offensive players, Archie Adamson, Billy Fitzgerald, and Newsy Lalonde – who had entered the fray and all walloped back at the now-outnumbered Gifford. Gifford was finally escorted off the field by a friend of his – but not before another fight broke out between ‘Pat’ Feeney and Nick Carter and spectators then streamed out on the field, many engaged in their own dust-ups with opposing fans. Police and park officials managed to corral the fans and clear off the field so the remainder of the match could continue. When he retired from the game after the 1912 season, in four professional seasons Gifford had played in 51 games with 1 goal to his name. He was sent off for 26 penalties for a total of 171 penalty minutes. 1911 was his most feisty season with 12 penalties and 82 minutes – a complete turnaround from the previous season when he was sent off for only 10 minutes from 2 penalties. He was 16th in overall career penalty minutes. When looking back at his entire senior and professional career, Tom Gifford was probably the best defenseman to suit up for New Westminster during the first two decades of the club’s existence. Gifford became the manager of the New Westminster Salmonbellies professionals in 1913 but his debut season came to an abrupt halt on July 5 when he lead his team off the field in protest five minutes prior to the start of the match. On the advice of two lawyers, Gifford refused to face the Vancouver Lacrosse Club on account of suspensions to ‘Mickey’ Ions and Harry Griffiths – (haven’t we seen these two names before?). Both players were still in Con Jones’s line-up when New Westminster arrived at Hastings Park. Jones refused to budge so the Redshirts walked off to their dressing rooms. Referee Fred Cullin then placed the ball near centreman Ernie Murray’s stick and blew his whistle. The Vancouver players then passed the ball around a dozen times before bagging an unopposed goal. After two more goals were scored in similar manner, the “game” ended and the angry crowd of 5,000 went home. Unbeknownst to most folks in attendance that day, they had witnessed the first nail in the coffin of the professional game on the Coast. It would be another 11 years before that lid was nailed tightly shut, but the newspapers of the day were nevertheless aware and observant that the sudden, acrimonious end of the 1913 BCLA season would become a serious obstacle for the sport to overcome. 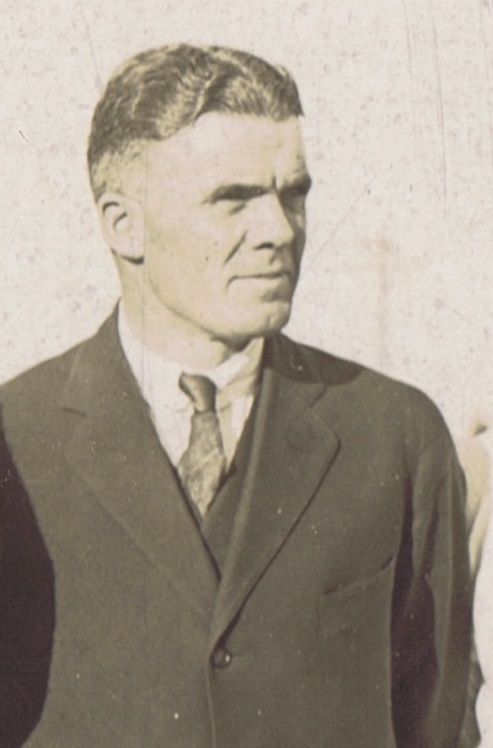 He would return as manager in 1921 – between which time the post was occupied by AE Kellington and former teammate Gordon Spring. Away from the game, Gifford worked as the superintendent for the Fraser River Bridge until his retirement in 1946 after 42 years of service. Thomas Stuart Gifford passed away in Seattle on May 4, 1966; he had moved to that city four years prior. 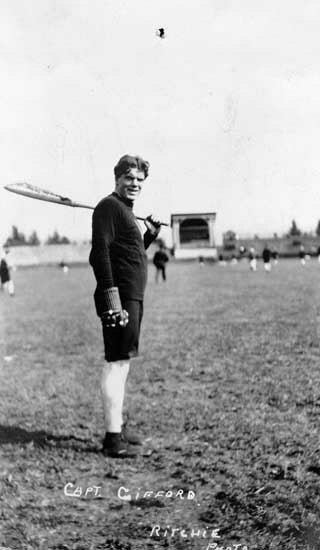 Later that year, he was posthumously inducted into the Canadian Lacrosse Hall of Fame as a field player. His brother and former team-mate Jim Gifford accepted the induction in his memory.